It’s pretty hot outside right now – 76 degrees and it is 6:30 in the morning. The other day my son sent a picture of his son in the pool at his other grandparents home in Tempe, Arizona. It was 6:00 in the morning and already 80 degrees outside. 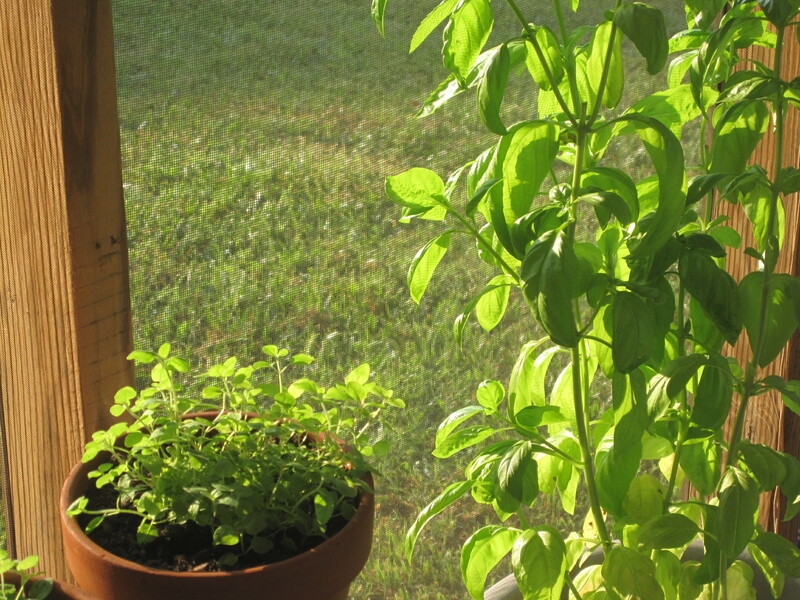 My herbs on the back porch are struggling with the midday heat reaching 100 degrees, but the early morning sun is a welcome treat for them. I just need to remember to take care of them and feed them doses of water during the day to keep them strong. I water my garden early in the day before the heat sets in. I realize that it might better to do in late in the evening but I go to bed too early. On the other hand I wake before dawn and find morning works best for me and my vegetables. Many are complaining, some are coming up with creative ways to survive, and sadly others are making tragic mistakes. Like the mother that left her two small children unattended for 45 minutes playing on a slip and slide in the back yard. Both died of heat exhaustion. Hearing that made my heart sink and although there may be more to the story, it still made me sad. Last week our neighborhood play group stayed outside all day. Temperatures were in the nineties with a heat index much higher. A couple of times I got dizzy and a couple of more times I got nauseous. I didn’t say anything. At 62, I didn’t want to drag the other parents down. I realized I wasn’t drinking enough water and corrected that and things improved. But the next time we get together we are going to Pump It Up or the bowling alley or the museum, some place indoors. Growing up in the deep South in Louisiana, it was not the heat so much as the humidity that made for a miserable day. We lived in an old house that had one window unit in my parent’s bedroom. But the rest of the house was cool and comfortable for we had an attic fan which kept the air moving in the house. Surrounded by huge oak trees the cool of the shade was sucked into the house by the fan and out through the attic. We were never hot indoors. But how nice it was to come inside on summer afternoons, snuggle up with a good book on my parent’s bed and then fall asleep in that cold room. I saw on Facebook a response to the question on how to keep your house cool. One person said she keeps her thermostat at 68. I had to laugh. If I kept my thermostat down that low, I’d be wearing a sweater in the house and paying my electric bill and not eating. Not to mention the fact that if everyone did that it might drain the system and we might suffer brown outs. We keep our thermostat set at 75 but the house stays at a steady 77, night and day. I’m keeping the blinds closed and using minimal lights and it is very comfortable in my house. Ceiling fans are a big help. And like the oregano and basil on my back porch, I’m staying hydrated, after all about 60% of my body is water according the Mayo Clinic. Water carries nutrients and oxygen to cells, helps to dissolve minerals and other nutrients to make them accessible to the body, lessons the burden on kidneys by flushing out waste products, helps prevent constipation, protects body organs and tissues, lubricates joints, moistens tissues such as those in the mouth, eyes and nose, and regulates the body temperature. It’s not how hot it is that counts; it is how I can make wise choices for my garden, my grandchildren, my community and myself that counts.